When we started planning our long overdue honeymoon, a few of our friends and co-workers told us that Oahu was the less Hawaiian of the 8 archipelago islands. Why is that - we asked. Well apparently is because of the famous Waikiki, the busy and modern beach area of Honolulu, Hawaiian capital city. It is indeed modern, with a lot of hotels, restaurants, stores and popular hang out places for tourists: Senor Frogs, Margaritaville, Hard Rock Cafe and many others. It is often compared to Miami Beach in South Florida, due to its crowds of curious tourists that fill the known hotels like the Outrigger Waikiki on the Beach (home to the Hula Grill restaurant) and the very expensive and exclusive Halekulani, where a lot of Hollywood stars stay. Honestly, we don’t know what the fuzz is about this hotel, aside from its security, since it is very simple. It is beautiful, but we found that it was very simple. However, it has one of the best places for brunch on Sundays and to watch the sunset every night, the House Without a Key bar. Even with the crowd of tourists and expensive hotels, we suggest don’t disregarding Waikiki... it does has charm. Go and surf or paddle surf in the clear waters of the beach, shop at the many, many ABC Stores (convenience/souvenirs shops that are located in every corner) and explore the International Market. This is an open strip in the middle of Waikiki Beach in Kalakaua Ave. filled with carts that sell jewelry, shirts and more. 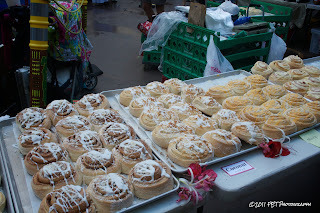 There’s a farmers market there every Thursday after 4pm where you can shop like a local and eat like one too! They have homemade pastries filled with guava, coconut, pineapple and more that will satisfy your sweet tooth and prepare you for dinner. Talking about dinner, although it is very touristy, there’s a place that you can’t pass on eating or at least having a Mai Tai. Duke’s Waikiki, located in the lobby of the Outrigger Waikiki on the Beach, is named after famous surfer Duke Kahanamoku, offers Hawaiian and American dishes. The best time to go is around sunset, usually between 5 & 6 p.m.. Order a sampler of appetizers that includes smoked Mahi Mahi with pita bread, capers and onions; ahi tuna sashimi and ahi poke. Poke is a very traditional Hawaiian dish with raw ahi tuna dice in cubes and seasoned with soy sauce, mahi onions and sesame seeds. Recipes vary so poke can be seasoned with different sauces and spices. All of them equally delicious! 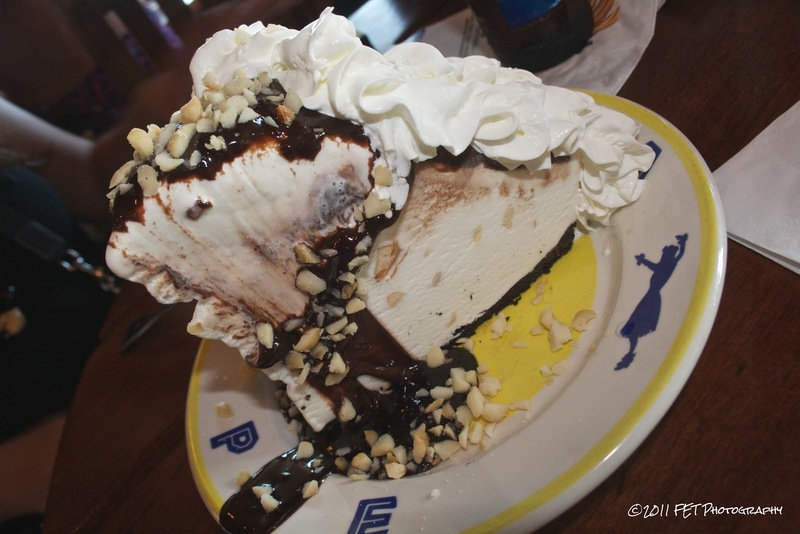 At Duke’s you should also have their famous Hula Pie for dessert. It is just a big piece of ice cream cake - a chocolate crust, vanilla ice cream topped with whip cream, chocolate fudge and macadamia nuts. It will not be the best dessert that you will ever have in your life but it is massive and refreshing, worth breaking your diet for. The macadamia nuts give it a distinctive flavor and crunch. 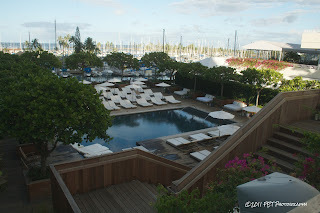 While in Waikiki, we stayed at the now controversial and still new hotel The Edition. Located at the Ala Moana Blvd, the hotel opened in October 2010 and it has struggle to have a name of its own and position itself as one of the best hotels in the area. It is operated by Marriott but the owner of the hotel M Waikiki LLC is blaming the hotel company for low sales and more. They even took it from Marriott a week away after our stay and gave it to another company that changed the name to The Modern Waikiki. But Marriott took it back a day after and now a legal battle has started over The Edition. The hotel it is very modern, very Miami looking and it doesn’t relate to Hawaiian culture - aside from the ukulele, beach sarongs and a few postcards. 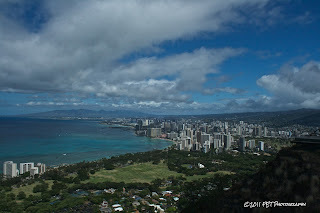 But it is comfortable, far from the Waikiki hustle and offers a different atmosphere. It’s white, whit wooden details - it reminded us a lot of a spa! Its main pool is small with salt water, cabanas with king white beds and lounges chairs with lots of candles and flowers all around. The bar is cozy and it feels like you are in the patio of a house. The hotel also has a sand beach bar where you can have drinks while soaking the bright Hawaiian sun. The lobby is small but don’t be fooled. They have a bookshelf that opens up every night to reveal a busy, hip bar that features special appearances by famous DJ’s. Overall a very cute, boutique like hotel. The Edition is also home to the restaurant of Iron Chef’s Morimoto. 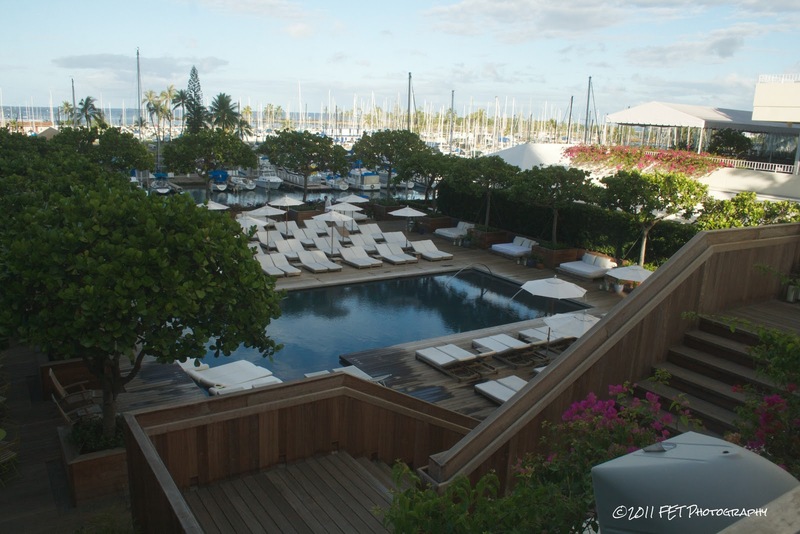 The place is also has white decor with a bar, sushi bar and a patio area with lounges, sofas and fire pits that offer a wonderful night view of the Ala Moana Marina. If you want a little history of Hawaii and get away from Waikiki, go and explore Honolulu’s historic downtown - only minutes away from the busy beach strip. Go to the Aloha Tower in the pier. It has a marketplace with shops and restaurants. Not far from it is the Iolani Palace, the first electrified building in Honolulu completed in 1882. It is a monument for the monarchy period of Hawaii and it offers daily tours about the history of the islands. Across the street is the statue of King Kamehameha. The original statue is actually on Big Island - Hawaii, but this second is as similar and grand as the first one and it’s a very popular picture spot. And to have different experience go to Chinatown and walk through the leis’ stores. You can get cheap lei and watch how they are made too. Don’t be fooled thinking that when you arrive to the airport you are going to receive a lei - this is not free. Unless you are picked up by a friend or a family member that lives in the islands, you will not get a traditional welcome lei. They have to be ordered in advance through your transportation service company and they are actually very expensive when done this way ($15 - $30 USD) and the price will depend on the flower that you choose. Some of the hotels give leis when you check-in but you also need to check with your hotel’s concierge about getting one. A great place for breakfast or lunch is a tiny restaurant called Eggs ‘n Things. But don’t go there starving, the wait for a table can be between 35 - 55 minutes - every single day. They are known for their pancakes, they are indeed very fluffy and delicious. Be sure to try them with coconut or guava syrup so you can have a true Hawaiian experience. Another great thing on their menu are their omelets , they are light and served with home potatoes. Delish! For brunch on Sundays, there are many options but the most popular are the ones at the House Without a Key at the Halekulani hotel and at Duke’s. Reservations are suggested since both restaurants offer beautiful views and you can have your meal outside. And last but not least, remember the Hawaiian motto: hang loose! 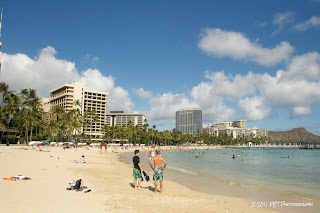 So if you go to Waikiki, be sure to hang loose and enjoy the busy area!